Howe & Company is an excellent place to work and build a career. The firm has a long and distinguished history with a stellar reputation for expertise, integrity and excellence. Our offices are located in the heart of the Power & Light District at 12th and Walnut, adjacent to the new Sprint Arena. We are committed to providing the flexibility of schedule to achieve a suitable work-and-life balance, and we offer a professional and amicable work environment that encourages employee input on firm operation. Our high-quality work product and our competitive posture will continue to attract clients of all industries and sizes. 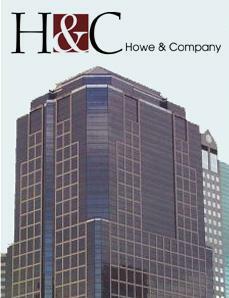 Howe & Company is an Equal Opportunity Employer that offers competitive starting salaries, free and convenient parking, paid CPE and a superb benefits package that includes health insurance, life insurance, a 401(k) with matching and profit-sharing contribution features, and a cafeteria plan that encompasses medical and dependent care expenses. Howe & Company is an excellent place to work and build a career. The firm has a long and distinguished history with a stellar reputation for expertise, integrity and excellence.